This page is about First Aid for Minor burns, so just to clarify, Minor burns are first degree burns and small second degree burns, smaller than 3 inches or 7.5 cm diameter. 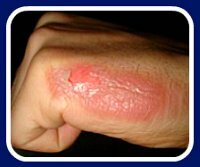 If the burn is deeper or more extensive than this then go to First Aid for Major Burns. The immediate priority is to stop the burning process. So cool down the area by running cool water over it (not cold). Put burn ointment or gel with aloe vera on the area after the pain has subsided. Cover the burn with a dry sterile non stick dressing. Pain relief may be required so tablet form and/or use burn ointment or an over the counter spray designed to reduce pain. Minor burn wounds can be prone to tetanus. If you have not had one within the last 5 years get one within 48 hrs. If it is a chemical burn (and if it's a powder brush it off first before applying water). Flush the chemical off with running water for 20 minutes this also incorporates the next step. 1. The immediate priority is to stop the burning process. So cool down the area by running cool water over it (not cold and NOT butter or anything else) or if this is difficult place a cold compress over it. Place a cool/wet clean cloth in between the compress and the skin. Placing ice directly on the burn can cause frostbite further damaging the area. Do this for at least 5 minutes or until pain settles. IF it is still painful continue with this process as it also helps reduce pain. 2. Burn cream or gel with Aloe vera is our preference - Aloe Vera aids in healing, pain relief, has anti-inflammatory properties, help prevent blistering and scarring. 3. Cover the burn with a dry sterile non stick dressing (so it has less chance of sticking if the burnt skin breaks underneath and it oozes). This will protect the burn from friction or pressure. Change every day. 4. Minor burns may only have reddened skin with no blisters and may be treated at home if you are comfortable with this. These may require pain relief so take whatever you would normally take for pain and/or use topical burn ointment or an over the counter spray designed to reduce pain. Note: blisters may develop over the next few days. 5. Minor burn wounds can be prone to tetanus. If the skin is broken and the person has not had a tetanus booster within the last 5 years they may very well need one. Seek advice from your doctor. The skin continues to burn even when the affected area has been removed from the cause. So cooling the area reduces the skins temperature and slows down the burning process quickly therefore preventing further damage. If the damaged area is bigger than their out stretched hand or bigger than the person's abdomen (so around 3 inches or 7.5 cm diameter depending on the persons age) call the emergency services in your area or take them to medical help. For burns that need medical attention please DO NOT apply cream or the like as it will make it difficult for medical help to assess the damage visually. If creams have been applied they will need to re-clean the area and this can delay assessment and treatment. Check the burn every day for signs of infection - increased pain (not necessarily itchiness as this can be part of the healing process), redness, swelling, pus, fever, red streaks spreading from the burn area or swollen lymph nodes. If you suspect infection is present then seek medical attention as wounds take much longer to heal when germs are present and sometimes will not heal at all. To prevent infection do not break blisters that may form (tempting as it may be for some) just let the body heal them from the inside out. For protection apply a non stick dressing in case it "pops". If it does "pop" keep it covered until healed as broken blisters are vulnerable to infection. If the dressing gets wet do not leave it sitting on an open wound as this can make it easier for infection to set in. As mentioned above itchiness can be part of the healing process so be careful to not scratch especially with dirty finger nails etc. If the burn is healing and does get itchy apply a moisturising cream or aloe vera. This will moisten the area, reduce dryness and therefore reduce itchiness. Electrical burns need to be seen by medical help as there can be more serious injuries under the skin that may not be visible to the eye. If the injury is sunburn then see First Aid For Sunburn. A burn area can be sensitive to sunlight for up to 12 months so once it is healed you may need to use sunscreen on the area. Minor burns will take 3-6 days to heal. We hope first aid for minor burns has been helpful and the burn heals nicely without a hitch.